CHARLES SUMNER. 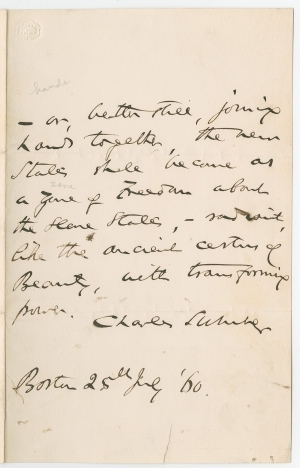 Autograph Quotation Signed, from a speech given at the Cooper Institute in New York City on July 11, 1860, “The Republican Party; Its Origin, Necessity and Permanence.” Boston, July 25, 1860. 1 p., 5 x 8 in. –or, better still, joining hands together, the new States shall become as a zone of Freedom about the slave States, –radiant, like the ancient cestus of Beauty, with transforming power. After being savagely beaten on the Senate floor, Charles Sumner was finally able to return to the Senate three years later, in 1859. His first speech following his return was “The Barbarism of Slavery,” delivered on June 4, 1860. Five weeks later, he spoke to a meeting of the Young Men’s Republican Union of New York. Four and a half months earlier, Republican Presidential candidate Abraham Lincoln had spoken at the same place in his famous Cooper Union speech that launched him into national prominence. In Chicago, the Republican Party had selected Lincoln as its presidential nominee, and the 1860 presidential campaign began in earnest. This document is a quotation, written and signed for an admirer, from near the end of Sumner’s fiery speech delivered two weeks earlier. It forms the end of the penultimate paragraph, after which Sumner urged all to “press forward in the work with heart and soul,” and ended with a quotation from Alexander Pope’s 1711 poem, An Essay on Criticism. Charles Sumner (1811-1874) was born in Boston and graduated from Harvard College in 1830 and from Harvard Law School in 1834. Admitted to the bar in 1834, he joined a private practice in Boston. From 1837 to 1840, he traveled in Europe and became fluent in French, Spanish, German, and Italian. He met many of the leading statesmen of Europe and determined to be an abolitionist when he returned to America. He became a popular orator for formal occasions, spoke against slavery and the Mexican War, and worked with Horace Mann to improve public education. In 1848, he helped organize the Free Soil Party, and in 1851, Democrats gained control of the Massachusetts state legislature in coalition with Free Soilers. The legislature elected Sumner to the U.S. Senate, where he served from 1851 to 1874, initially as a Free Soiler and later as a Republican. He became a leader of the opponents of slavery in Congress. When Sumner mocked pro-slavery Senator Andrew Butler of South Carolina in 1856, Butler’s cousin Representative Preston Brooks retaliated by beating Sumner into unconsciousness on the Senate floor. While Brooks became a hero in the South, most northerners were outraged at the assault on free speech. Sumner traveled to Europe twice to recuperate and did not return permanently to the Senate until 1859. During the Civil War, Sumner was a member of the Radical Republicans, who pressured President Abraham Lincoln to issue an emancipation decree. Sumner served as chairman of the Senate Foreign Relations Committee, from which he orchestrated U.S. recognition of Haiti in 1862. After the Civil War, Sumner was instrumental in the impeachment proceedings against President Andrew Johnson. Small “Delarue & Co. London” blindstamp at head. Lightly dusted, short closed edge tear [no loss], Fine. A belt or girdle. The goddess Aphrodite had a magical woven golden cestus that made her irresistible to men.